I don’t have a great deal of a post to share with you today! Just a photo from the weekend when I had a great day out at the finals for Top Model Uk. I will be giving a full report of the day next week. It was amazing! I had a tough time deciding on what to wear. It started at 1 pm and I wondered if there would be people in evening dress or just smart dress. I decided to play it safe and go smart casual. Cream top, Beige trousers and one of my favourite silk scarves. I did also take with me my Navy blazer. The event was held at the stunning Hilton London Metropole. A huge hotel and very nice too. So keep your eyes peeled for the post next week. I also wanted to thank everyone for their wishes last week for the in-laws. The mother is well on the mend and due to come home, however, the father in law is really not good at all. Hence why this is such a short post. I hope I have better news for you all next week. Thanks for linking up to Top of the World Style. It's a nice look. Very pretty outfit, elegant with the touch of lavendar with the scarf! I love your scarf!!!! Thank you for the link-up! I bet you had a great time and looking forward to hearing all about it. Lovely choice of scarf. You've peaked my interest. What a marvelous time you must have had. 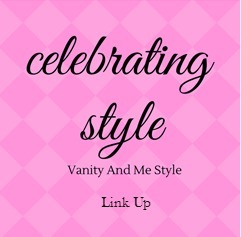 Thanks for joining the Fine-Whatever link up. How cool that you got to go to the top model finals! I'm looking forward to that post, for sure. Your outfit is so classic; I love it. Golly, you do move in some amazing circles! Good move with the outfit. My thoughts and good wishes go out to your family. The color combination is so flattering. You look gorgeous! Thank you for inviting me here. Laurie—this is such a perfect example of how a scarf can make an outfit shine!! Very elegant outfit. Looking forward to read the hole post next week. Hope you can enjoy your weekend. Such a beautiful classic look! Thanks for linking up with me! Sending best wishes for your father-in-law, Laurie. Looking forward to reading your review of this glamorous event. Your choice of outfit was chic and stylish as ever – clever choice! Wow, I cannot wait to read all about the event, Laurie. I think you dressed perfectly. I am glad to hear your in-laws are improving. Have a wonderful weekend! You look very elegant, I look forward to seeing more photos of the event. I hope your father-in-law is better soon. Glad you mother-in-law is doing better, and I hope your father-in-law will improve soon, too. You look great! I love the scarf! You look great in this picture! Love the look and thanks for the link up! Happy Weekend! Great look! I love to wear white and tan together. The silk scarf looks great, perfect colour with the beige. Looking forward to hearing about Top Model. It's my guilty pleasure! Sounds very interesting and fun. I tend to rely on black for safety if I'm unsure. Silk cuts it though 🙂 . You look elegant and spring like. Will you do a post on what others wore? You look fabulous, Laurie. All the best for your father in law!